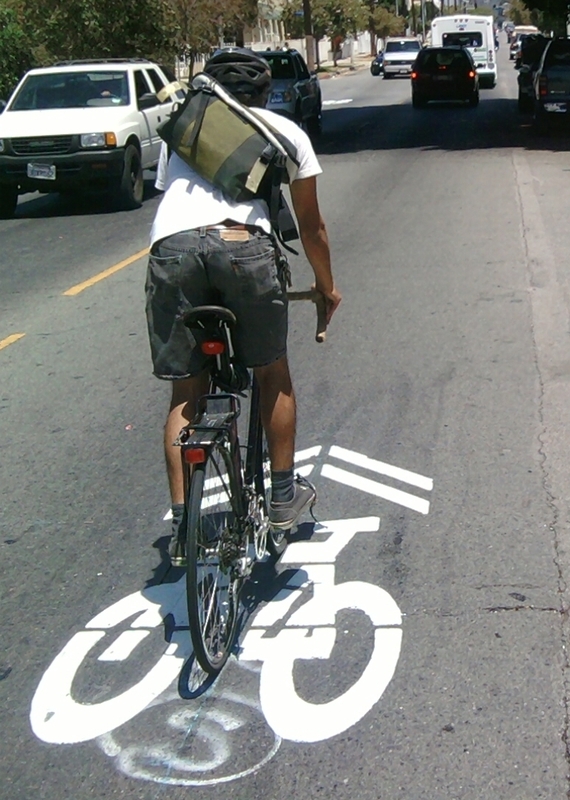 How Long Does It Take LADOT to Install a Sharrow? The city of Los Angeles’ Transportation Department (LADOT) seems to operate at two speeds. Both unhealthy. The difference in how long it takes LADOT to implement sharrows is instructive. 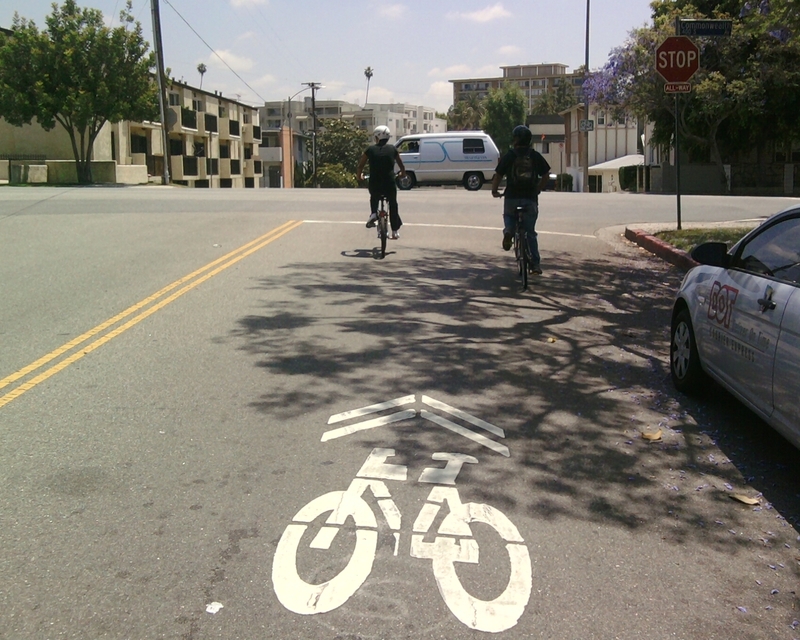 Just how long does it take LADOT to install a sharrow? Let’s say that a bunch of bicyclists push for implementation of sharrows. 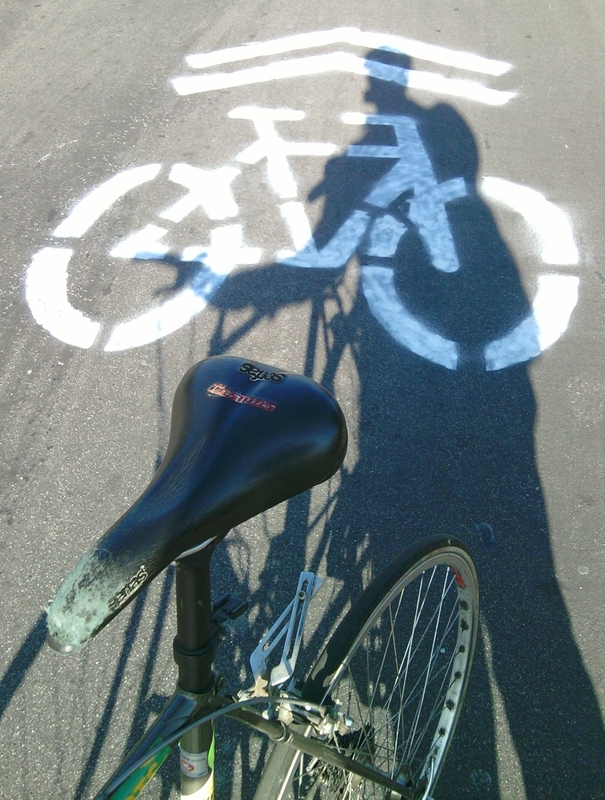 Well… then it takes LADOT about five years to paint their first sharrow. Let’s say that a bunch of councilmembers, planning commissioners, city departments, a mayor, and a bunch of bicyclists agree to a bike plan for implementing bike lanes instead of sharrows – and LADOT figures it can hoodwink them all by doing sharrows instead of what’s actually in the approved bike plan. Well… then sharrows are done in just 34 days. Rumor has it that the city's dead bike plan, strangled in its infancy, is buried underneath one of the inappropriate preliminary sharrow Xs painted on L.A. streets. Yesterday, I had the disappointment of spotting the Los Angeles City Transportation Department’s (LADOT’s) preliminary X markings for placement of sharrows on Fountain Avenue, Vine Street, and Yucca Street. It frankly made me feel frustrated and irritated. To me, these markings are the first clear on-the-ground indications that neither the LADOT nor Mayor Villaraigosa are committed to implementing the city’s Bike Plan. 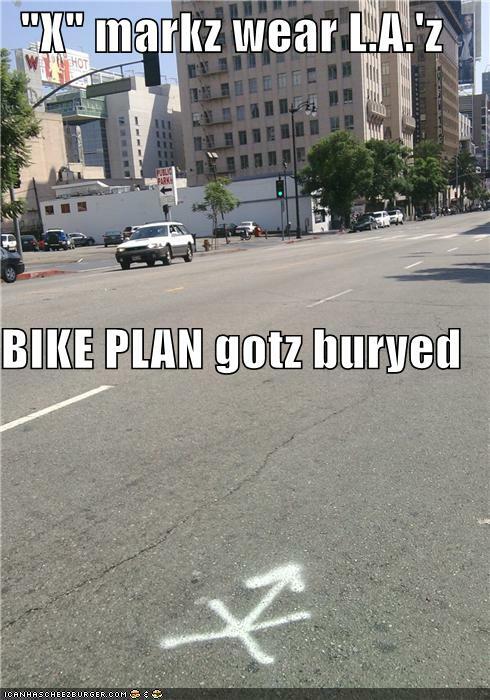 I am not going to re-state the entire saga (more detailed rant here), but here’s an outline: On March 1st 2011 (less than 7 months ago) L.A. City approved its Bike Plan which includes what bike facilities get implemented where and when. The approved Bike Plan Five Year Implementation Strategy specifies implementation of 40 miles per year of bike facilities. Mayor Villaraigosa pledged implementation of 40 miles of bikeway per year; same as in the plan. Then, in late August, the LADOT stated, instead of the approved 40 miles of bike lanes and bike boulevards in the plan, we’re implementing something different: 20 miles of sharrows. Sharrows are the cheapest crappiest bike facility, and studies are clear that sharrows shouldn’t be used where there’s space for bike lanes. Many of the announced sharrow streets are wide enough for bike lanes, and many have bike lanes approved in the Bike Plan, but the city is instead plopping down ill-considered, inappropriate sharrows. (The overall quantity of 20 miles of sharrows in a year is way more than what was approved; the bike plan states only 7.7 miles of sharrows in the first six years of plan implementation.) Summarizing: focusing on sharrows, LADOT is downgrading and delaying the approved Bike Plan, skipping analysis of what facilities are appropriate and safe, and implementing the cheapest and least effective measures to meet the letter of the mayor’s pledged 40 miles. When you're the LADOT and you don't really want to implement approved Bike Plan facilities, do sharrows on streets wide enough for bike lanes instead. Grrrr. This study … does not recommend that shared lane markings [ie: sharrows] be used as a substitute for bicycle lanes where they are a feasible option. Even the folks who like sharrows aren’t doing them where bike lanes are easily feasible. Unfortunately, this is exactly what LADOT says that they’ll do “by year’s end” on nearly a dozen street segments in its we’re-doing-sharrows-instead-of-the-bike-plan list. 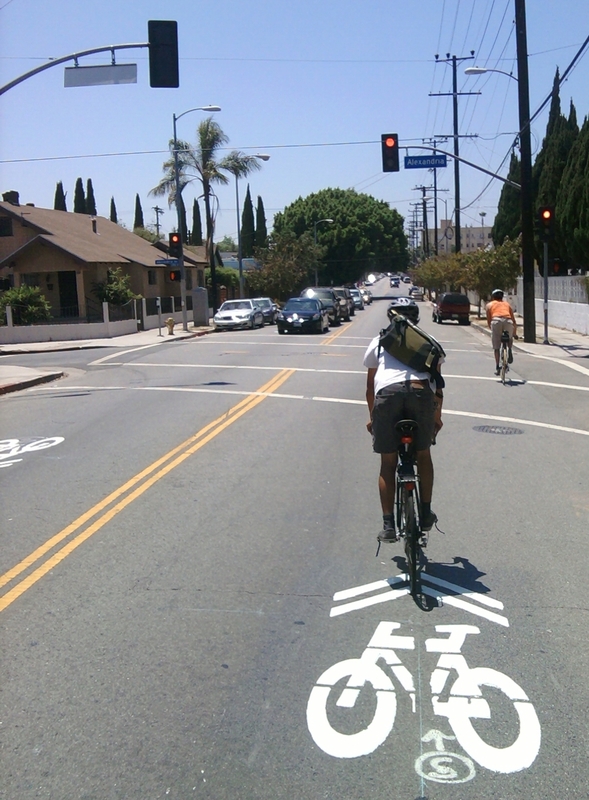 Where do sharrows work best for L.A.? This article features even more analysis of the L.A. City Transportation Department (LADOT) listing of streets where they’re going to put sharrows. I’ve spent time looking into the specifics of the list, because it seems urgent, so I am not going to dwell too much on the big picture frustration: LADOT shouldn’t be prioritizing sharrows, which are cheap and inferior to the bike lanes and bike boulevards specified in the city Bike Plan. Instead, here I am focusing on the details of the sharrows list, hoping to head off LADOT inappropriately slapping down sharrows in the wrong places by year’s end. Some streets that receive the sharrow treatment are too narrow for bicycle lanes such as Fountain [Avenue] and Arden Bl. It’s another bike facilities post at L.A. Bike-0-Vill… er… I mean Eco-Village. Read below to find about some Los Angeles streets planned (and not so planned) for bike lanes and for sharrows. Coming soon to a street where you ride!